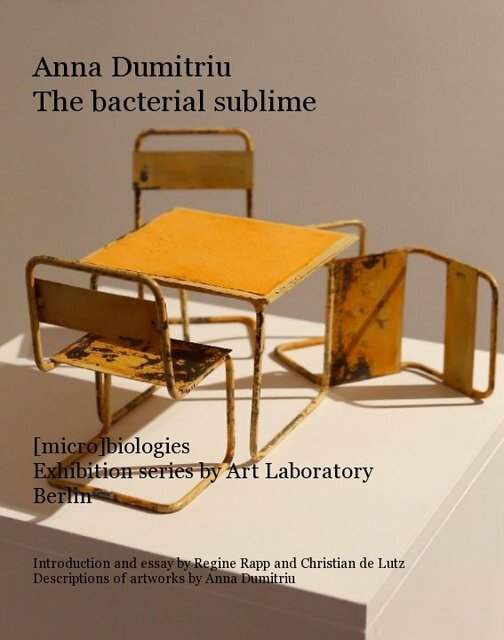 A catalogue for the retrospective exhibition of Anna Dumitriu's artworks "the bacterial sublime" at Art Laboratry Berlin curated by Regine Rapp and Christian de Lutz, part of the [micro]biologies exhibition series. Anna Dumitriu’s work is at the forefront of art and science collaborative practice, with a strong interest in the ethical issues raised by emerging technologies. Her installations, interventions and performances use a range of biological, digital, and traditional media including live bacteria. She has a strong international exhibition profile, having exhibited at The Science Gallery in Dublin, The Museum of Contemporary Art (MOCA) Taipei, and The V & A Museum in London. She is collaborating as a Visiting Research Fellow: Artist in Residence with the Department of Computer Science at The University of Hertfordshire and Artist in Residence on the UK Clinical Research Consortium Project “Modernising Medical Microbiology” at The University of Oxford. She was winner of the 2012 Society for Applied Microbiology Communication Award and her major new Wellcome Trust supported exhibition “The Romantic Disease: An Artistic Investigation of Tuberculosis opened in London in January 2014.